Floral Silver Drop Earrings, "Chiang Mai Rose"
Roses blossom with silver splendor, becoming earrings of timeless elegance. From Achara, the earrings are crafted by hand with masterful artistry. 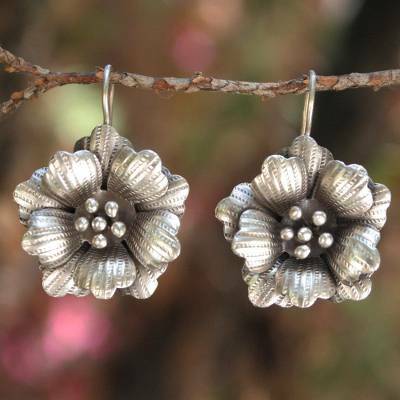 You can find silver flower earrings 'Chiang Mai Rose' by Achara in jewelry categories such as Floral Earrings, No Stone Earrings, Silver Earrings, Fine Silver Earrings and Drop Earrings. Enjoy exploring these sections for other Novica treasures. "Chiang Mai Rose Silver drop earrings"
Very pleased with these earrings. Beautifully crafted. A good size with long hooks (so they won't fall out of my earlobes). These are way larger that the picture acknowledges. Way larger! !